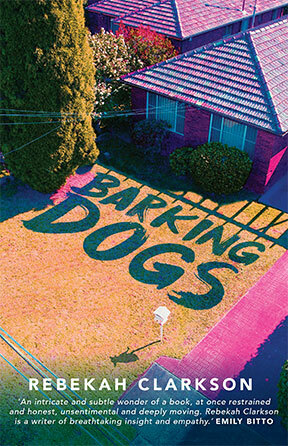 In the town of Mount Barker, you might see Nathan Hearle obsessively recording the bark of a neighbourhood dog, or the Wheeler family sitting down for a meal and trying to come to terms with a shocking discovery. You might hear tales of fathers and their wayward sons, of widows who can’t forgive themselves, of children longed for and lost, of thwarted lust and of pure love. Within the shadows is an unspeakable crime. Rebekah Clarkson has created a compelling, slow-burning portrait of a town in the midst of major change as it makes the painful transformation from rural idyll to aspirational suburbia. What looked like redemption is now profound loss. What seemed spiteful can now be forgiven. A novel in stories, Barking Dogs is an assured debut from one of Australia’s most respected storytellers.